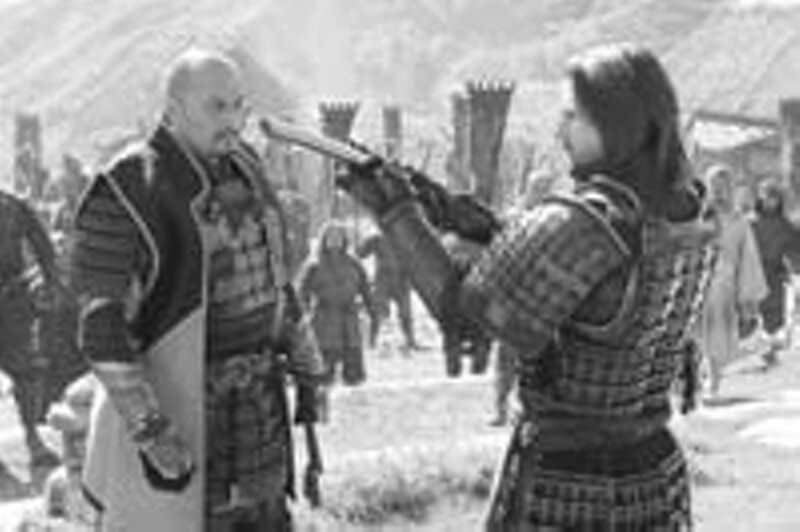 Warner Bros. Pictures Fighting to be the last: Ken Watanabe and Tom Cruise in The Last Samurai. Whatever else it may accomplish, the new Tom Cruise movie, The Last Samurai, demonstrates that Hollywood continues to conjugate that popular verb, "meet." Whatever the claims from the industry and the dutiful hype from the faithful Fidos of the media, the picture positively shouts its origins in some communal cogitation that no doubt concluded with a neat summary of the film --- "Dances With Wolves meets Shogun." Although a number of other sources lurk in the background, that particular combination most aptly and succinctly describes the movie, a variant on the Western set in the East. Tom Cruise plays Captain Nathan Algren, a highly decorated Civil War hero who later fought Indians in the Seventh Cavalry, along with General George Armstrong Custer. Disgusted and disillusioned by his participation in the slaughter of Indians, a self-hating drunk, Algren now earns his living demonstrating the glories of the Winchester rifle. His life changes when two of his former comrades, Sergeant Zebulon Gant (Billy Connolly) and Colonel Bagley (Tony Goldwyn) offer him the opportunity to make a good deal of money helping them train the army of the Emperor of Japan in Western methods of warfare. The classic encounter between East and West, initially filtered through the process of military training and combat, forms the essential content of the movie. Eager to adopt Western innovations like the railroad and the telegraph, but controlled by a group of greedy businessmen, the emperor needs a modern army to defend himself against an uprising of the traditional samurai, devoted to a medieval warrior code of loyalty, courage, and honor. When the emperor's advisors insist on a premature attack by the ill-trained army on the samurai, Algren witnesses that code in action. The defeated general commits suicide and the samurai leader, Katsumoto (Ken Watanabe), following the dictates of tradition, beheads him. Admiring Algren's courage and tenacity in the battle, Katsumoto spares his life, taking him as a hostage to a remote samurai settlement in the mountains. The movie settles down into a long, placid idyll, showing Algren's recuperation from his wounds, his introduction to the manners of an entirely alien culture, and his gradual instruction in swordsmanship and the traditions of the Japanese warrior. He and Katsumoto, predictably, not only learn something of each other's history and beliefs, but gradually become friends and even comrades in arms. Their relationship and their experience in combat suggest that both of them ultimately qualify as the title character. The film displays the necessary epic grandeur mostly in its great battle scenes, with their shots of thousands of marching soldiers, the roar of cannon, the charge of men on horseback, the panoramas of misty landscapes and majestic mountains. Its central and obvious clash between East and West involves a deeper and more permanent conflict, also entirely suitable for the epic, the encounter between past and present. The samurai represent the admirable and even beautiful codes of a rigidly ordered medieval society, which faces inevitable destruction in the realities of the modern world. As the emperor laments, adopting Western dress, railroads, and cannon has destroyed the glorious history of his people. Since the battles generally show a badly outnumbered group of swordsmen fighting against howitzers and Gatling guns, their conclusion is never in doubt, which again emphasizes the essential conflict and its inevitable result. To die heroically in battle, preferably against great odds, however, appeals to the samurai. When Algren tells Katsumoto about the vainglorious folly of Custer in sacrificing two hundred men against thousands of Sioux, the Japanese expresses admiration of the general and puzzlement at Algren's bitterness. The frequent flashbacks to the butchery of the frontier that haunts Algren, along with the numerous voiceover commentaries by Cruise and a British expatriate (Timothy Spall), who in effect witnesses the movie, underline the connections between The Last Samurai and Westerns like Dances With Wolves, or even A Man Called Horse. Algren's life among the Japanese, his initiation into their culture, his decision to fight with them rather than against them, parallel the stock encounter of numerous films in which the white man comes to learn and eventually adopt the customs and behaviors of the Native Americans. The commentaries tend to drift off into the soft dreaminess of legend, so that finally Nathan Algren virtually fades into the landscape like some mythic hero of the golden West. In an expansive work like The Last Samurai, individual performance hardly stands out or even matters, so Tom Cruise's relatively modest abilities serve him at least adequately. He rides horses, swings his swords around, looks anguished or pleased when the occasion demands it, and that's about it. His Japanese counterpart, Ken Watanabe, makes a nice contrast, all stern dignity, modified by moments of ironic humor and flashes of anger. In keeping with the general tone of the movie, however, his character remains static throughout, ending as inevitably as the picture ends, defeated not only by technology and circumstance, but by time itself, the last samurai indeed. The Last Samurai, starring Tom Cruise, Timothy Spall, Ken Watanabe, Billy Connolly, Tony Goldwyn, Hiroyuki Sanada, Koyuki, William Atherton, Masata Harada, Togo Igawa, Scott Wilson, Shoji Yosihara, Shichinosuke Nakamura, Seizo Fukumoto; written by John Logan, Marshall Herskovitz, and Edward Zwick; directed by Edward Zwick.